therosegardener.com grew out of the rose industry and rose gardens by ryan. we started bringing gardeners the best in pruners, gloves, loppers, sun hats and roses on fortuniana rootstock. the rose gardener then expanded into garden dï¿½cor that now includes collector hummingbird feeders, birdhouses, wrought iron seed trays, hand-blown gazing balls and fabulous flower vases. 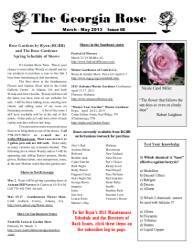 we also have one of the country's best newsletters about roses. check out our catalog, we'll send holiday gifts all over the county. you will definitely want to garden with us. rose, roses, rose gardens, rose care, maintenance, design, landscape design, roses by ryan, ryan tilley, rosarian, greater atlanta rose society, georgia, atlanta roses, perennial flowers, garden shop, messenger fertilizer, georgia rose, rose newsletter, rose show, american rose society, pruning, long stem roses, roses without thorns, bionic gloves, trellis, arbor roses, rose landscapes, patio rose gardens, rose gardener, rose exhibitors, new, fragrant roses, pruner, lopper, barnel pruners, barnel professional tools, miniature roses, floribunda roses, fortuniana rootstock, rose services, new rose garden, installation, rose advice, rose pests, blackspot, gardening know how, questions, rose photography, custom rose garden, designs, rose guy, fortuniana roses, southeast, jackson & perkins roses, rose gardens by ryan, rose beds, garden with us, the rose gardener, american rose society, national arthritis foundation, gauntlet rose gloves, bionic rose gloves, puncture resistant, puncture resistant gloves, rose shop, large roses, botanical rose vase, vase, bringing neglected rose gardens back to health. the rose gardener is the web destination for rose gardeners all over the united states. utilizing years of rose growing/gardening experience we searched out the the most functional, up-to-date gardening tools and information. pruners, loppers, bionic specialty gardening gloves, messenger, trugs and other gardening basics . . . plus you’ll want to check out one of the most comprehensive newsletters out there on growing and maintaining roses, “the georgia rose”. don’t let the name fool you, this newsletter is utilized and enjoyed by rose gardeners all over the united states. check out the free sample issue. after you’ve shopped for the basic tools, check out our “birding” and decorative gardening accessories. therosegardener.com, just link over. you’ll find bird feeders, hummingbird feeders, gazing balls, and very special bird houses . . all functional and fabulous.